Bruce Benson, a nationally recognized leader in business, education and philanthropy, continues to set a high bar for work ethic, integrity and a commitment to free-market principles. Bruce currently serves as president of the University of Colorado. Under his leadership, he has shattered records for enrollment, donations to the university and research funding. He successfully instituted business-minded efficiencies and cut the university bureaucracy: CU’s overhead is now 28 percent below its national peers. Just after graduating from CU Boulder, Bruce formed Benson Mineral Group, an oil and gas exploration and production company. In time, BMG expanded from oil and gas to banking, commercial real estate, cable television and a host of other enterprises. This maverick businessman has a history of promoting a free marketplace of ideas and fostering environments where discussion and debate are the building blocks of his success. 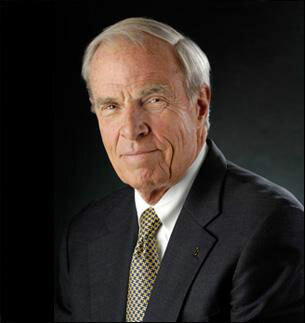 In 2009 he was inducted into the Colorado Business Hall of Fame. Bruce was an early supporter of The Leadership Program of the Rockies, helping to create the program which now has over 1,400 graduates. He served as chairman of the Colorado Republican Party four times and has had leadership roles in many presidential, state-wide, and local campaigns. In addition, he has been active in a broad spectrum of educational, civic and political initiatives at the state and national levels. Bruce and his wife, Marcy Benson, are avid philanthropists who have been enormously supportive of many groups, including Children’s Hospital Colorado, Boy Scouts, Denver Public School Foundation, the Denver Zoo and the University of Colorado. Their work has earned them the respect and admiration of the community and the high regard of charitable recipients throughout the state. Bruce and Marcy live in Denver. He has three children and 10 grandchildren. Nominate a Leader in Action! Copyright © 2019 Leadership Program of the Rockies. All Rights Reserved.